Today is Nawami (Ninth) day, a day before the Vijaya Dashami. Sacrifices continue throughout Nawami in Nepal. Today god Vishwas Karma, the God of creativity is worshiped. All artisans, craftsmen, tradesmen worship their tools, equipment and vehicles like cars, bikes, trucks etc. for protection against accidents during the year. Animals are also sacrificed to cars, trucks etc. to get the blessing from goddess Durga for protection for vehicles and their occupants against accidents during the year. 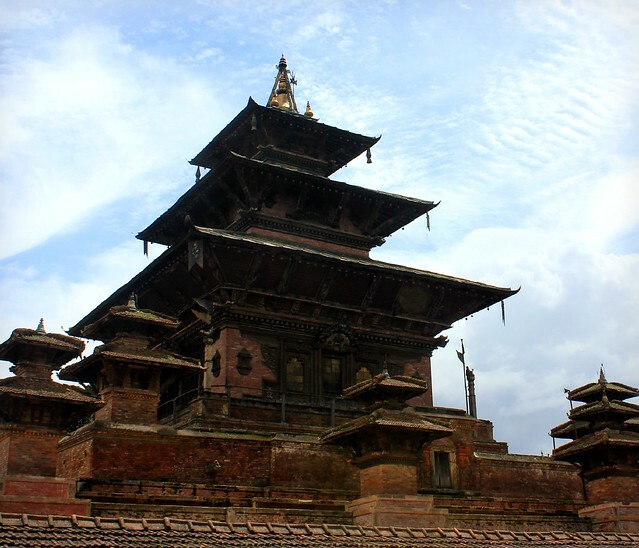 The Taleju temple at Hanuman Dhoka is opened for the public only once a year on this day. Thousands of people go and pay their respect to the goddess. Temples of the goddess are filled with people from dawn till dusk. There are local processions – local bands play music and a feast is organized – in the Taleju Bhawani Temple in Hanuman Dhoka Palace premises. Today also the official military sacrifices are held in the ‘Kot’ courtyard at Hanuman Dhoka. The government allows foreigners to witness this function so hundreds of tourists and diplomats eagerly gather here. Animals, mostly buffaloes are slaughtered by the hundreds to honour Durga the goddess of victory to seek her blessing. Military bands play war tunes, guns boom and officers with beautifully decorated medals in full uniform are present there. When the function ends the courtyard is filled ankle deep with blood from the sacrifices. Kumari, the living goddess, also blesses the public on this day from her residence at Kumari Bahal. 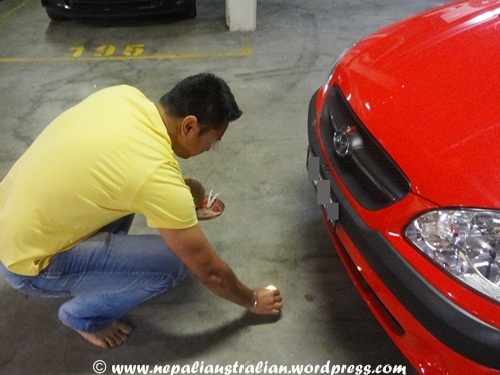 This morning we performed car puja as well. 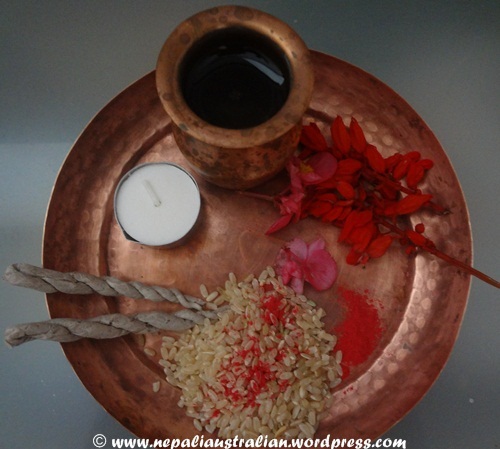 I am sure in Nepal, it is performed in a bigger scale but if you are not in Nepal and want to perform the puja, I am sharing how I did it here. Make sure the vehicle is clean. Take your shoe off before puja. Prepare puja thali with sindoor, rice, flower, dhuup, batti, fruits and any other puja saman you have. Also prepare an ankura (vessel) with water. If you don’t have a ankura then use a glass/tumbler. Start the puja by sprinkling water in front of the car and its four wheels. If you have any idol of a god inside the car, perform the puja inside first by putting sindoor, tika and flower on the idol. 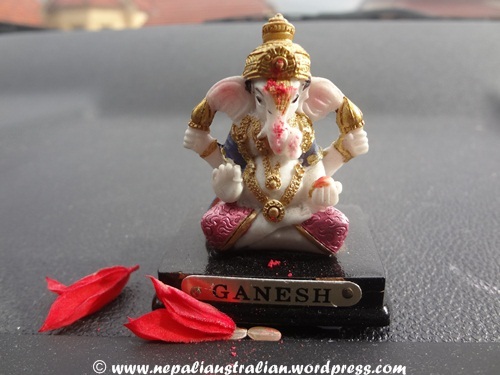 I have an idol of Lord Ganesh inside our car. 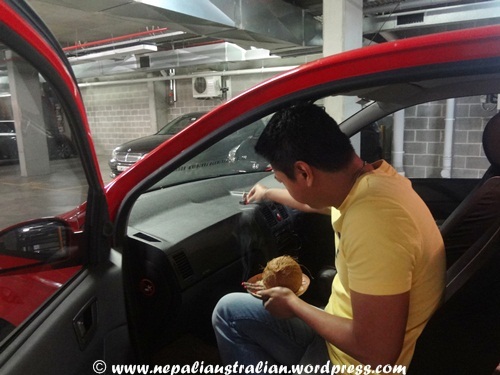 In front of the car use sindoor to make a half moon by using the third finger of right hand and put tika and flower. Also do the same on all four wheels of the car. Now light the batti (I used tea light candle) and dhuup and show it to the God inside the car, the front of the car and move to all the wheels by circling them around three times in a clockwise direction. Normally animals are sacrificed during the Puja and the vehicles are given their fill of blood but we used a hard shelled coconut instead. 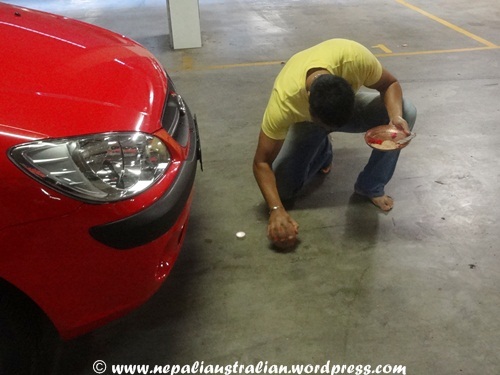 Sprinkle the coconut water in front of the car as well as all wheels. 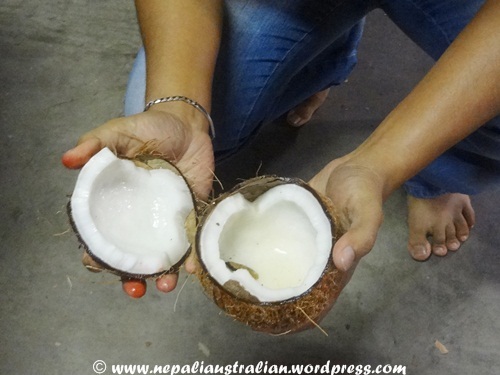 The coconut is kept as prasad (holy food offering given to God during pujas) and eaten later. 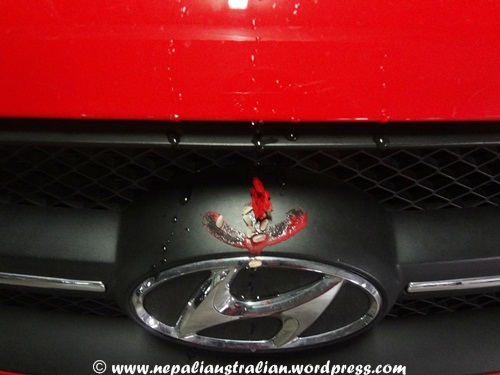 In Nepal they also put mala (flower garland) in front of the car. 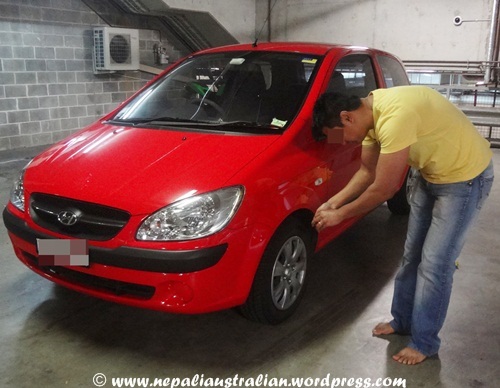 This entry was posted in Nepal, Nepali Festivals and tagged artisans craftsmen, car pooja, cars, Dashain, Durga, goddess durga, hard-shelled coconut, how to perform car puja, Maha-Navami, Nawami, nepali australian, Nepaliaustralian, Puja, Vijaya Dashami, Vishwakarma. Bookmark the permalink.